Giulio Tampalini is Professor at Conservatory “Antonio Buzzolla” in Adria. Bachelor and Master degree information, Erasmus, favorable terms. 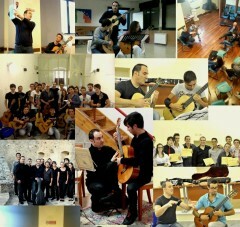 The International Brescia Guitar Academy stands as one of the at Italian excellence for professionality, preparation of teachers and the organization of competitions and musical events. The passion for music is combined with the sensitivity and the attention devoted to each activity.